Earlier I used to give external pull up or pull down resistor wherever required but now I am wondering whether I can do away with external components and use the pull down feature of the micro-controller itself. Will that be a good thing to do? Is there some use case where I should take extra precaution or not use this feature at all? If this satisfies your requirements, then, you can do away with external components. Edit Remember that at Power up, Pins will be tristated. If it does not hamper your application, it is good! That's why it's good practise to init IO section first and then go ahead with other peripherals. In general, it is perfectly fine to use the internal pull-up or pull-down resistors. Disadvantage is that you can forget to enable it from software, that can cause a little headache. The external pull-ups will always be there. So do not forget to enable the internal ones and save a lot of PCB area by reducing component number. The STM32's internal pull-up and pull-down resistors usually have a value between \$ 30\small~k\Omega \$ and \$ 50\small~k\Omega \$. You should always check if your application needs a certain pull-up or pull-down resistor value before using the internal resistors. For example do not use them with I2C, as these values will be too high for that. Unless the pullup and pulldown resistors are active during reset (I suspect they aren't, but I'm not familiar with STM32 devices), there is an undefined pin state at reset. This is one major reason to use external pullup or pulldown resistors. the voltage at start-up and reset is unimportant. 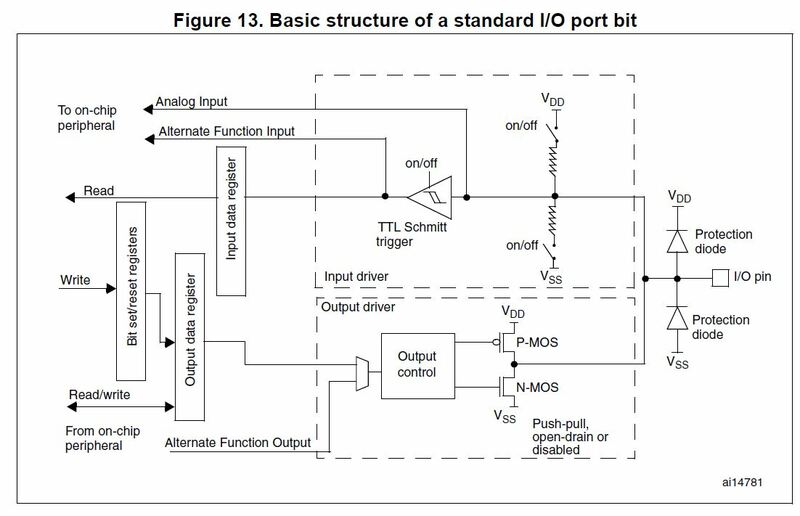 On the last point, remember that CMOS inputs at mid-voltage level can cause significant shoot-through current on their input pair. This can cause a problem in a low power system during start-up. In general, external pull resistors will yeild a more conservative design. In addition to the other fine exceptions listed in all the answers, the internal pull-up resistors are too weak for I²C in many cases. Not the answer you're looking for? Browse other questions tagged microcontroller stm32 input pullup pulldown or ask your own question. Why are pull up resistors more common than pull down resistors? MSP430G2553 and LDO ADP162: Is an external pull-down necessary?